The majority of pergolas are built with pressure treated wood. The type of wood varies from pine to cedar to redwood, but the lumberyard is still most people’s favorite source of materials. You still may want to paint or stain the pergola either for added moisture protection or just to match the design of your house. Now you certainly can build a pergola and then paint it afterwards such as in the photo above. Clearly you will already have plenty of experience standing on a ladder by that time! However, we have found it to be pretty slow going and not a little bit hard on the arms to paint a pergola once it has been built and set in place. You will also have spots where the paint wont quite line up no matter how perfectly detailed you might be with a paint brush. 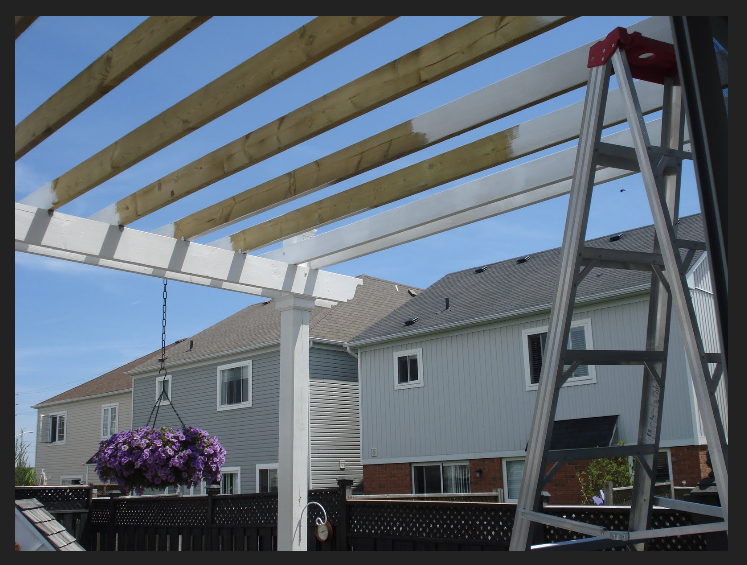 We’ve found it to be not just easier, but also resulting in a higher quality paint/stain job if you paint the pieces before you build the pergola. You will find that your coverage is much smoother and more complete and your arms wont be quite as tired! Just keep some extra paint on hand to use as a touch up once the pergola has been built. You can cover up any scratches and also cover up the bolts and nails used to secure everything together. We hope you find this tip useful – as always please join us to receive more tips as well as a complete guide to building a pergola in one weekend. 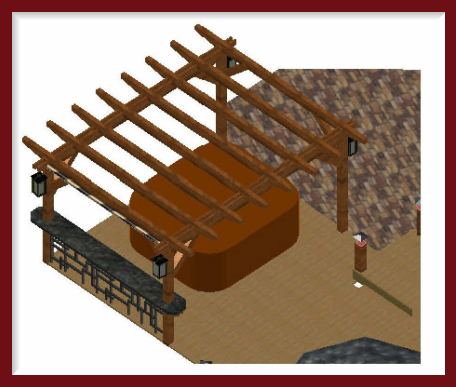 Choosing which material to use to build your pergola is dependent on many factors. Budget, of course, would be the first. It is quite astonishing how different the prices can be even amongst the different timber varieties. For instance, in the drawing above there are 24 pieces of wood (4 posts, 8 knee braces, 4 beams, 8 rafters). Pressure treated pine would total around $400. Cedar would total $1,000 and redwood would break any budget! A similar vinyl pergola kit would run well over $1,000. So if you are determined to spend less than $1,000 is the pressure treated pine a valid option as far as durability and appearance compared to cedar? Pressure treated pine definitely stands up to the durability test. As long as you make sure any ends you may have to cut to create your desired pergola design are also properly treated before final construction, then this very hard, solid wood will last for decades. We know of a properly drained set of pressure treated pine posts buried into concrete casings in the ground in an area of the country where the ground freezes that were still in fantastic shape after over twenty years. The old posts had to be removed to make room for a newer, larger pergola and even the timber that was in the ground was free of moisture damage. The bigger difference between the two materials is in their appearance. A pergola built from pressure treated pine will definitely look more rustic or natural. There could easily be visible knots in the wood. Now, the pieces can be either stained to a darker hue or painted, but that ads an extra level of ongoing maintenance as weather and wind will wear down the exterior layer and need freshening up. Cedar looks beautiful and elegant on its own without any staining or painting needed. It’s natural oils protect it just as well as pressure treating. If you are really determined to have the look of cedar, then shop around lumberyards for sales to try to bring the material cost down a little more. Otherwise, it may be completely worth it to spend the little bit of extra money to build a cedar pergola.